The Annual Report of Arunachal Pradesh state commission for women for the year 2014-15 & 2015-16. The 28th Annual Report of the Arunachal Pradesh Public Service Commission for the year 2015-16. The Arunachal Pradesh Public Service Commission Regulation (amendment) along with notice. The Arunachal Pradesh Right to Information Rules-2005 (Amendments and guidelines). The Arunachal Pradesh Information Commission Annual Report-2013 to 2015 along with notice. The Arunachal Pradesh Anatomy Bill 2017. The goods and Service Tax Bill 2017. The Arunachal Pradesh Protection of Interest of Depositors (in financial establishments) Bill 2017. Parliamentary Affairs Minister Bamang Felix moved the eleventh report of Business Advisory Committee presented by the Speaker which was adopted. Nabam Tuki laid the Report of First Rules Committee. Deputy Speaker Tumke Bagra and Chairman laid the Report of Select Committee on Arunachal Pradesh state Roads (regulation and development) Bill 2015. Minister Finance Chowna Mein laid the Report of CAG of India on state Finances for the year ended 31st March 2016 (Report No 1 of 2017). Finance Minister Chowna Mein laid the Report of CAG of India (Social, Economic, General Revenue and Economic (PSUs) Sectors) for the year ended March 2016 (Report no 2 of 2017). Minister Agriculture Wangki Lowang introduced and moved the Arunachal Pradesh Agriculture Produce and Livestock Marketing (Promotion and facilities) Bill 2017. 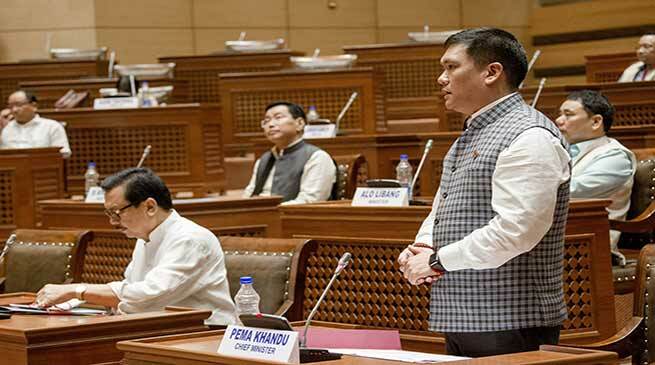 District Administration Incharge Minister Pema Khandu introduced Arunachal Pradesh (re-organisation of district) Amendment Bill 2017. (III) Parliamentary Affairs Minister Bamang Felix introduced the bill ‘Arunachal Pradesh Speaker and Deputy Speaker salaries and allowances (amendment Bill 2017. Minister Parliamentary Affairs Bamang Felix introduced Arunachal Pradesh Salary an allowances of the Ministers (Amendment Bill 2017. Minister Parliamentary Affairs Bamang Felix introduced the Arunachal Pradesh salaries, allowances and pension of Members of Legislative Assembly (amendment Bill 2017.